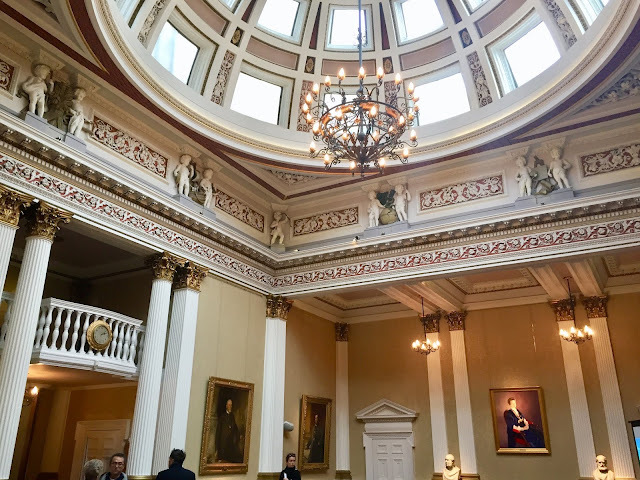 On the Saturday, I finished my walking tour in the morning and then headed into the New Town to see The Merchants' Hall, on Hanover Street. It's a building I must have walked past a hundred times before, but never taken much notice of. It belongs to the Royal Company of Merchants, a society that has existed in the city since the 13th century. Details of their history were in the information booklets provided on arrival! They've been in this premises since 1874, a beautiful neo-classical building, which can be hired out for weddings and events as well. 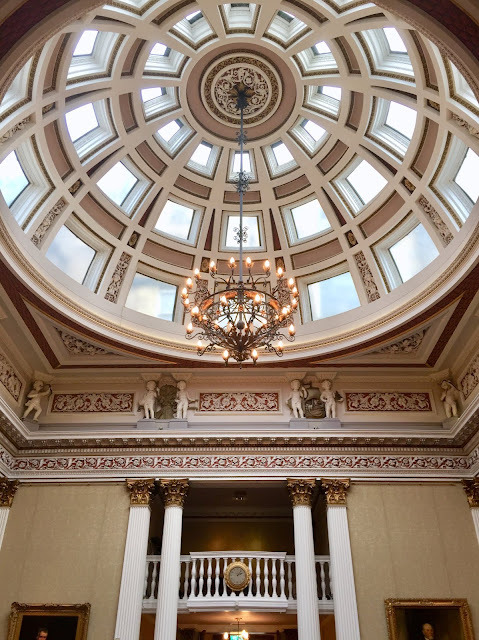 The Main Hall is the centrepiece of the whole thing, a large open room, with a domed ceiling and decorated frieze just below it. It's a very light and bright room, so it's easy to see why people would choose to have weddings and such here. The walls are lined with portraits and busts of various notable Masters, benefactors, and patrons of the Company, including Queen Elizabeth II, the first patron, and Prince Philip, Master of the Company in 1965. 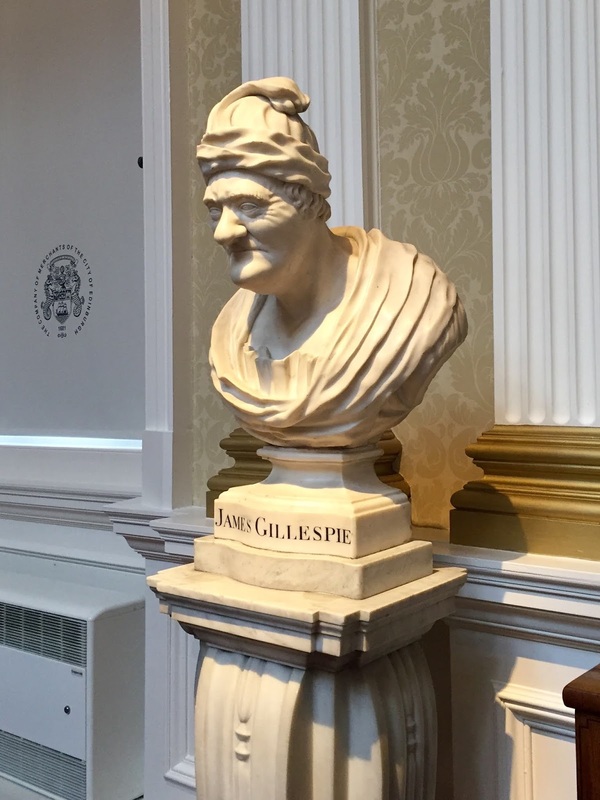 Other notable figures include George Watson and James Gillespie, who both left their fortunes behind to found schools, the former of which is now still owned and run by the Company (the latter was passed over to the City to keep it public rather than charging fees). More portraits of people with links to the Company line the stairwell to the first floor, and the Crush Hall, which is the anteroom you reach first, has photos of past Masters, and a list of their Honorary Members. The Crush Hall is quite a small area, with only pillars separating it from the hallway, and the most striking thing it has is a large painting at the far end, which features over 100 company members at an event in the Main Hall, painted in 2014. Next to the Crush Hall, is the Master's Court Room, where the Company meet several times a year to discuss business matters. 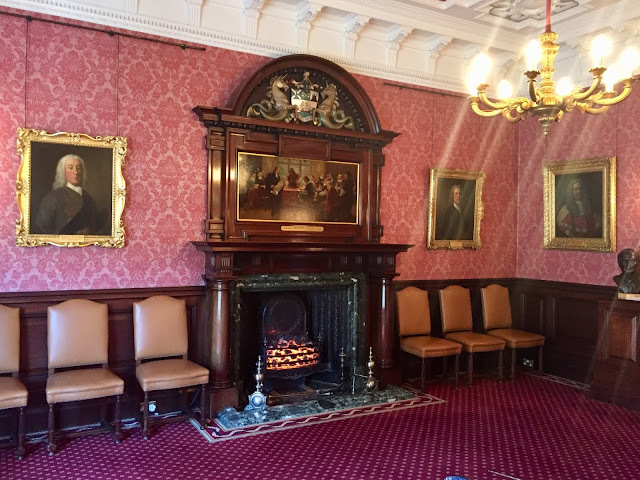 It has a much darker, plusher colour scheme that the Main Hall, with thick carpets and a large black fireplace at the end. Downstairs in the basement, you can see a hallway containing the Matriculation of Arms of the Company's schools, including George Watson's, Stewart's & Melville, and the Mary Erskine School. On the other side of the stairwell is the Archive and Treasure's Room, which has display cabinets with dozens of artefacts and memorabilia relating to the Company's history, particularly that of the schools it runs. I mostly went to admire the building, which was suitably impressive, as I wouldn't say I took great interest in the Company and its history prior to going to it, but it turned out to be interesting to learn about something that I would have been largely unaware of otherwise! Later in the afternoon, we headed into Parliament House, just behind St Giles' Cathedral. 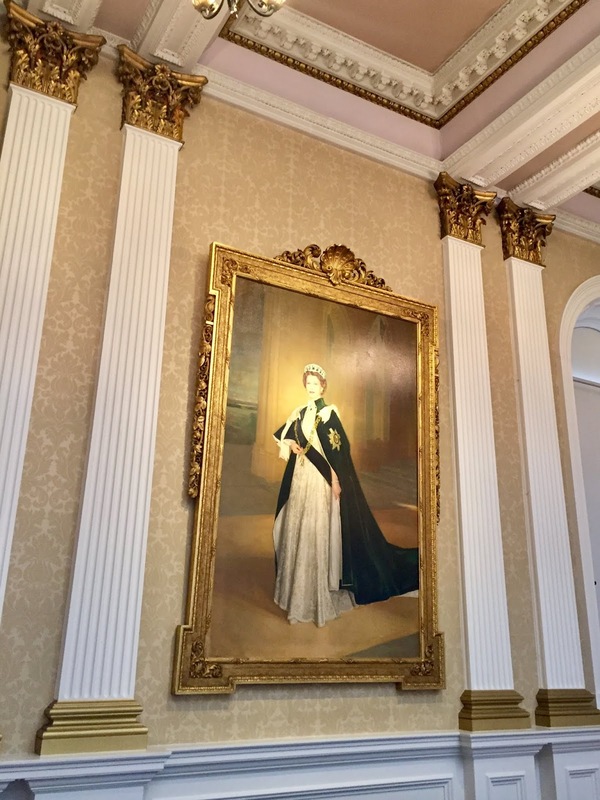 This was once where Scottish Parliament met, back before the United Kingdom was formed, at which point it moved to London to merge with the English Parliament. Nowadays, the building houses the Scottish Supreme Courts, so you can actually visit at any time of year if you wish to attend the public civil cases taking place there (criminal trials are held in the High Court building across the street). 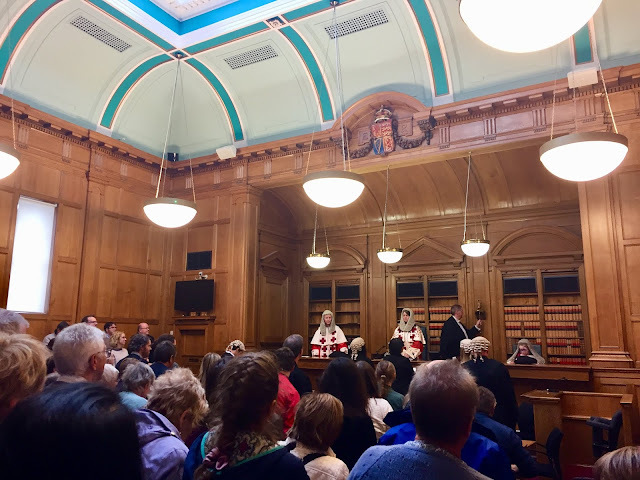 For Doors Open Day, they also opened up the Advocate's Library for tours and were doing re-enactments of the infamous William Burke trial, but these were fully booked when we arrived. 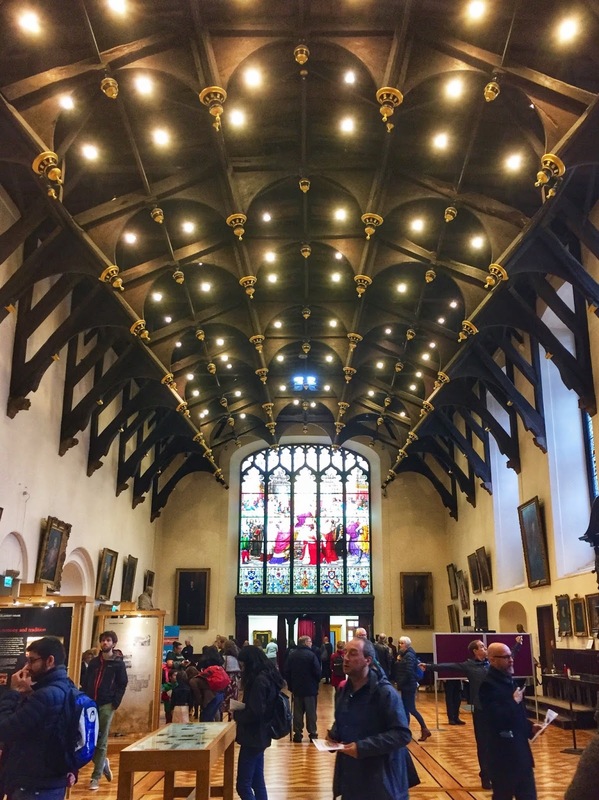 Again, I don't know much about or take great interest in law, but the building is suitably impressive, and also historically very significant - I talk about it on my tour every day, yet had never been inside! It was constructed in the 1630s, although more work has been done to it since then, meaning most of it now dates to the 19th century. Parliament Hall is the first area you enter, and probably the most impressive, which is where the Parliament used to meet for their debates and sessions. 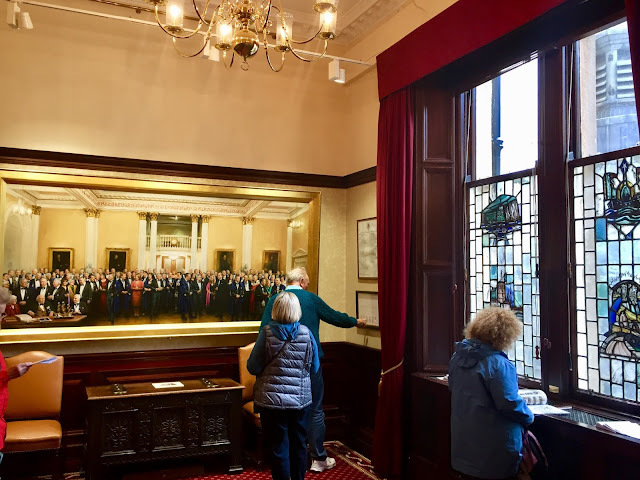 Much of the hall is open space, with many signs and display cases telling you more about the building's history, and how the Scottish Courts operate now. 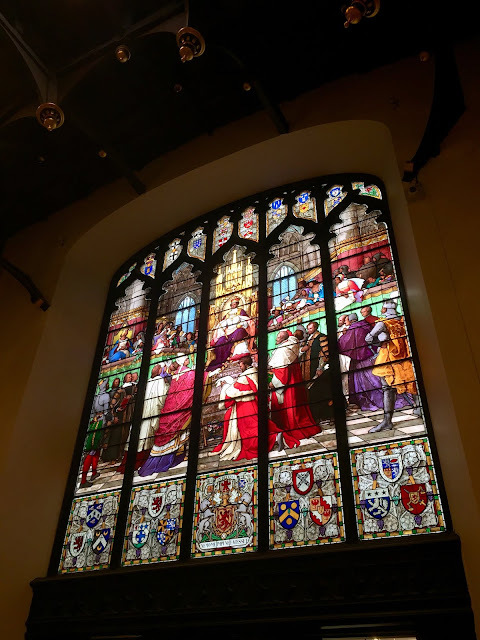 Some of the most stunning features of the hall are the original open timber roof, built in the 1630s from Baltic oak, and the Great Window, a huge stained glass display installed in 1868, showing the founding of the Court of Session in 1532. 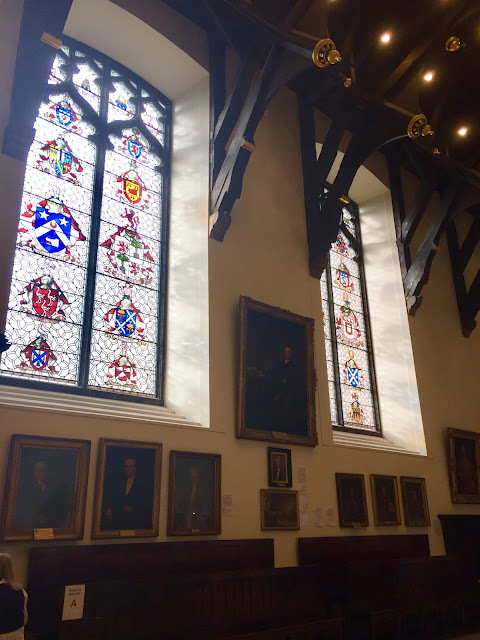 There are many other portraits and busts around the hall too, and while we couldn't get into the Advocate's Library, we could see a little of it through a window, and photos of it on the display boards. 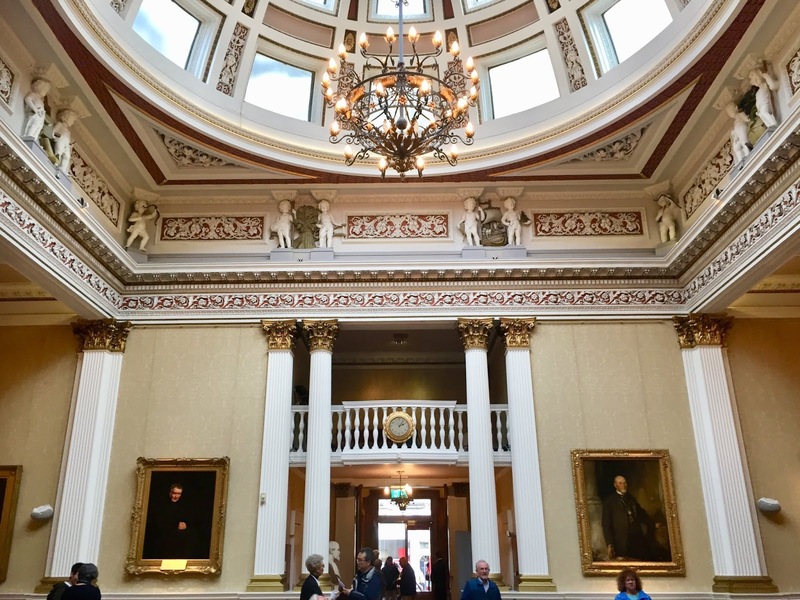 We then continued into the rest of the Court building, which was added on later in the 19th century, and has a much more modern design inside. 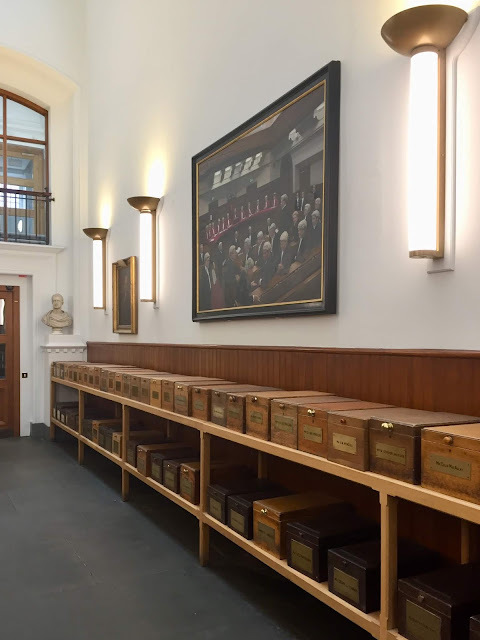 Some older features remain though, such as the Box Corridor, a long hallway full of wooden boxes with names on the side, which were used to deliver papers to the practising Advocates - sort of like a pigeon hole system! 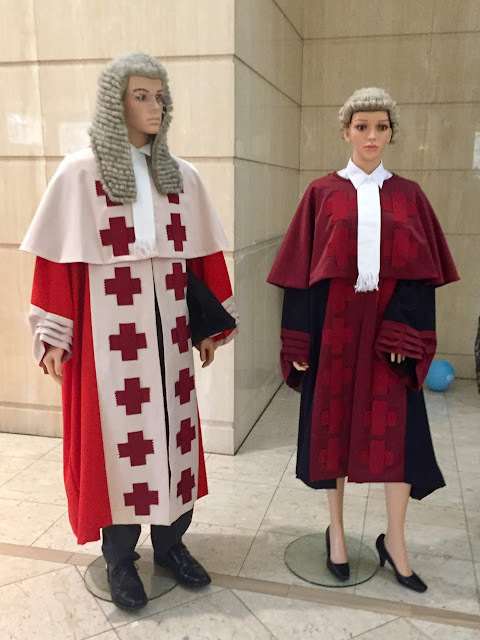 At the far end of the building, there was a display set up with courtroom attire and maces. 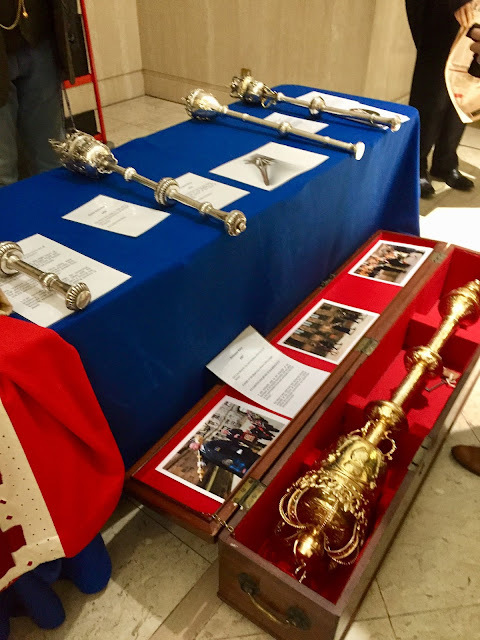 You could try on the garb of the judges and advocates, including gowns and wigs, and pick up maces which have been in use for centuries. One of the staff there was an actual macer, who explained more about his role - traditionally the macer was like a bodyguard for a judge, carrying a mace for defence, but nowadays the mace is more ceremonial, and he also carries out various other duties for the judge and to help the advocates and witnesses and such within the courtroom. Most of the courtrooms were locked, aside from the one where the Burke trial was taking place. We weren't allowed in while it was happening, since it was full, but we did get to slip in to the corner just as it was finishing, to take a quick glance around the room - not for long though, as everyone started streaming towards the door when it ended! It looked like quite a comfortable room actually, and wasn't super modern, but certainly more up-to-date than Parliament Hall, though nowhere near as splendid or impressive! The building started to close soon after the trial ended, so it was time to depart again. I was glad I went, since it's such a massively important building to Edinburgh's history, and I certainly learned a little bit more about the Courts than I previously knew - plus, Parliament Hall is another very impressive piece of architecture and design in Edinburgh! Part 2 of Doors Open Days is here now!